Comprising 5 interrelated R&D work packages to investigate the novel productivity enhancement technology, the SURE project structure is designed to enable good integration of the topical research to be conducted by the partners allowing optimal information flow, extensive knowledge sharing and to some extent researcher mobility. The work package structure is organised such that findings from the current state-of-the-art will influence the design of the experimental work packages, where the radial jet drilling technology will be investigated across different spatial and temporal scales. 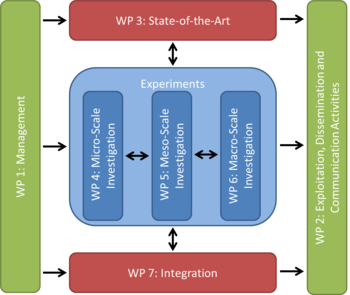 The knowledge generated through the experiments gives input to the well optimization procedures investigated in the integration work package 7.